Driving home late one night, Phryne Fisher is surprised when someone shoots out her windscreen. When she alights she finds a pretty young man with an anarchist tattoo dying on the tarmac just outside the dock gates. He bleeds to death in her arms, and all over her silk shirt. Enraged by the loss of the clothing, the damage to her car, and this senseless waste of human life, Phryne promises to find out who is responsible. But she doesn’t yet know how deeply into the mire she’ll have to go: bank robbery, tattoo parlours, pubs, spiritualist halls, and anarchists. Along this path, Phryne meets Peter, a scarred but delectable wharfie who begins to unfold the mystery of who would need a machine gun in Melbourne. But when someone kidnaps her cherished companion, Dot, Phryne will stop at nothing to retrieve her. 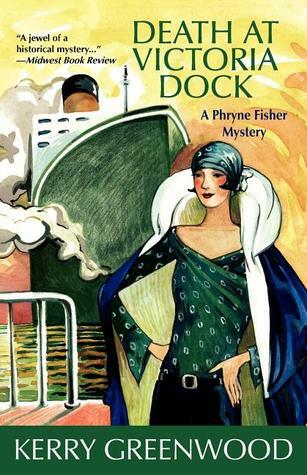 Death at Victoria Dock is the fourth book in the Phryne Fisher Murder series, which I decided to pick up on a whim after a particularly exhausting week. I have found that these short, yet intricate, mysteries and the corresponding TV episodes always put a smile on my face when I need a brief escape from adulthood. Phyrne is out for a late night drive near the waterfront when a bullet shatters her windscreen. In typical Phryne fashion, she leaps from the vehicle to chase down the shooter only to discover another victim, a young man bleeding to death on the dock. He dies in her arms. Phryne takes it upon herself to avenge his death and finds herself thrust into the middle of a Latvian anarchist war. Once again, Phryne just cant seem to stay out of trouble! This story follows the same formula as the previous in the series; Phryne investigates two separate mysteries simultaneously. The first deals with the Latvian anarchist and the second concerns a domestic matter of a well-to-do Melbourne family. One reason I enjoyed Death at Victoria Dock is that it brings to focus two drastically different cultural elements. On one hand we have Latvian revolutionists who have fled to Melbourne, struggling to find a life and dragging their war with them. Phryne works with Peter, who tells her all about the revolution and the struggles of being forced to constantly relocate. And on the other side we are trust into a petty, sad, selfish mystery of a family so full of self-importance and self-destruction. This contrast drags to the surface an intellectual depth we have yet to see in Phryne, which makes me love her character even more. Plus, readers get to spend more time with Phryne’s adopted daughters Ruth and Jane, who are always up for their own investigation. Bert and Cec lend their expertise on communism and we hear about their time in The Great War. And we finally get to see the awkward budding relationship between Dot and Constable Hugh Collins! My only complaint is the differences between the TV show and the story. (I know…I can feel many of you rolling your eyes. It’s ludicrous that I would prefer the show over the book) The show does such a wonderful job showing Phyrne’s very different struggles with her two cases. In the episode we see how the death of the young man traumatizes Phryne; flashbacks elude to to her roll as a nurse during the Great War. The story lacks these tantalizing details of Phyrne’s past. Plus, there has yet to be a mention of her snarky working relationship with Inspector Jack Robinson. (I need this to happen!) Honestly, that’s the only thing I didn’t like. I thought the story was fabulously written! Of course I recommend Death at Victoria Dock, and I am ready to pick up the next installment. This is definitely the perfect series for a lite afternoon read. (Parents and students: pick up this series! I know you’re dealing with stress with the first day of school right around the corner) I will make Phryne fans out of all of you! Happy reading!